Along with other nonprofit partners, the Pacific Crest Trail Association’s volunteer program coordinates thousands of helping hands from the deserts of Southern California all the way to the Cascade Mountains of Northern Washington. Thinking of becoming a volunteer? Let me tell you a little about our trail maintenance program, and help you decide if it’s right for you. Photographs courtesy of Shonda Feather, Gray Feather Photography. Who’s volunteering on the Pacific Crest Trail? PCTA volunteers come from all walks of life, age groups and backgrounds. 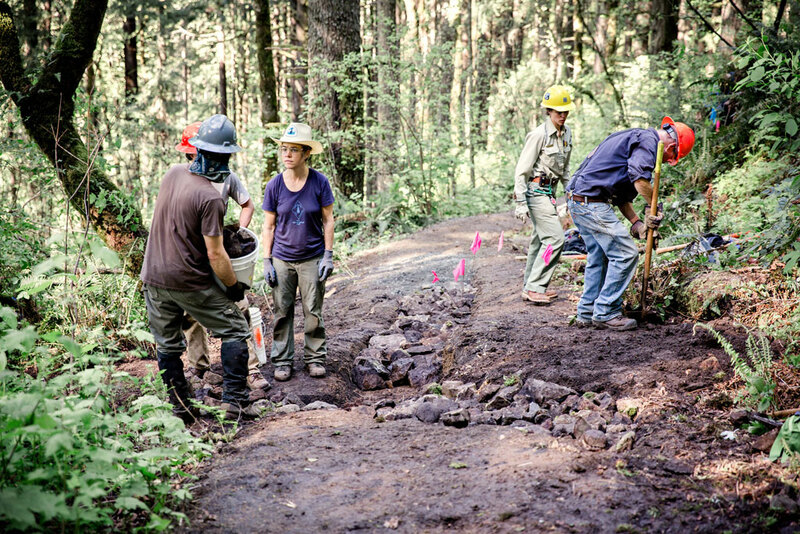 The bedrock of PCTA’s volunteer program includes 12 community-based volunteer groups dispersed along the trail in California, Oregon and Washington. These groups tend to designated stretches of the PCT by communicating with PCTA and local agency partners in all trail maintenance efforts. Major metropolitan areas provide a solid foundation of committed volunteers and novices for these groups, and each season they are joined by volunteers from across the country and around the world. As a result, PCTA’s community-based volunteer groups contribute to the cultural transformation of local communities by bridging the gap between the great outdoors and those that are disconnected. See our list of PCTA’s community-based volunteer groups. There you’ll find links to PCTA groups’ websites and contact information for group leaders. Another component of PCTA’s volunteer program is our Skyline-Sasquatch Volunteer Vacation series. This series of week-long volunteer projects takes experienced backpackers and trail maintainers into the Oregon and Washington backcountry to tend to major tread erosion. PCTA enlists dedicated volunteer horsepackers to bring supplies and tools to these and many other backcountry crews. The Pacific Crest Trail also benefits from the time and energy of volunteers from our nonprofit and corps crew partners. Volunteers from organizations like Washington Trails Association, American Conservation Experience, and Tahoe Rim Trail Association contribute thousands of hours to the PCT each year! 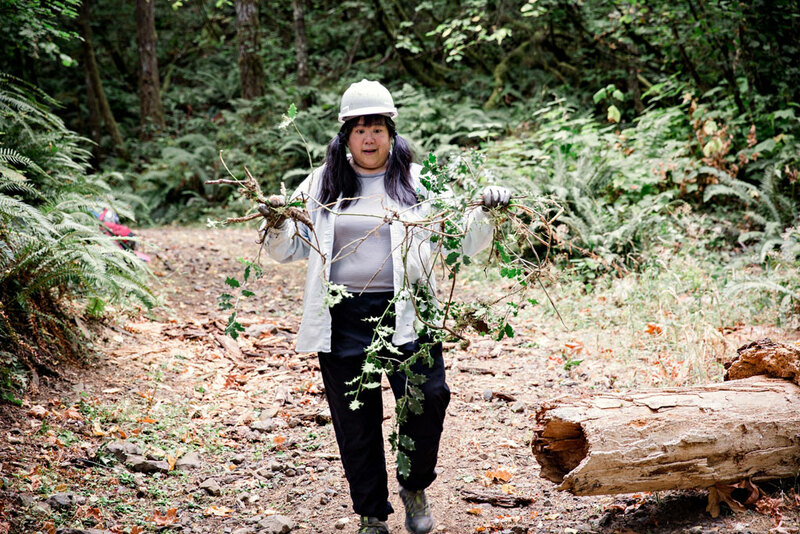 What do PCTA’s trail maintenance volunteers do? 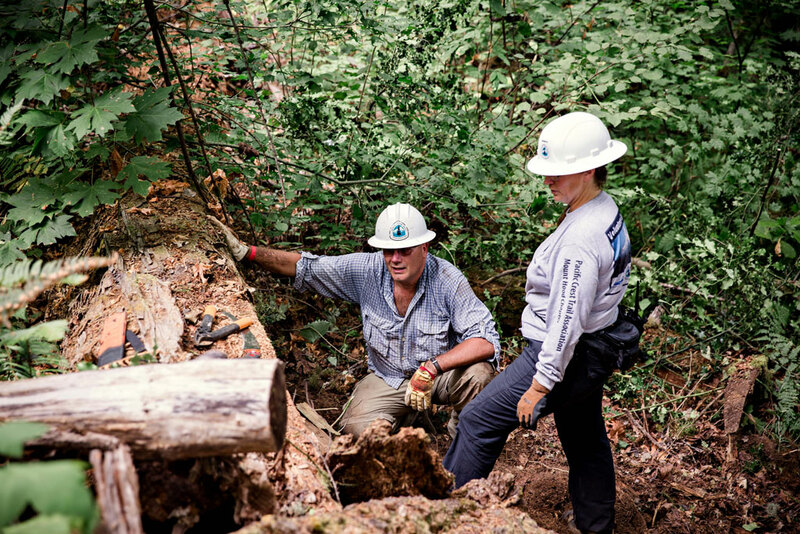 Trail maintenance volunteers do it all: cut back overgrown brush, rehabilitate trail tread, clear fallen logs, install and maintain drainage features, install signage and build structures such as rock retaining walls and bridges. Trail maintenance volunteers are typically the first to scout areas where maintenance is needed and perform much of the coordination required to ensure the maintenance happens. From major reconstruction following wildfires, wind storms, and floods, to annual maintenance needs caused by vegetation growth and natural erosion, volunteers help tackle it all. Since much of the trail is covered in snow during winter and spring, the “high season” for trail maintenance volunteers mirrors that of most other trail users: April through September. The exception, of course, is in Southern California. Many Southern California trail maintenance projects take place January through March. Where’s the work being done? 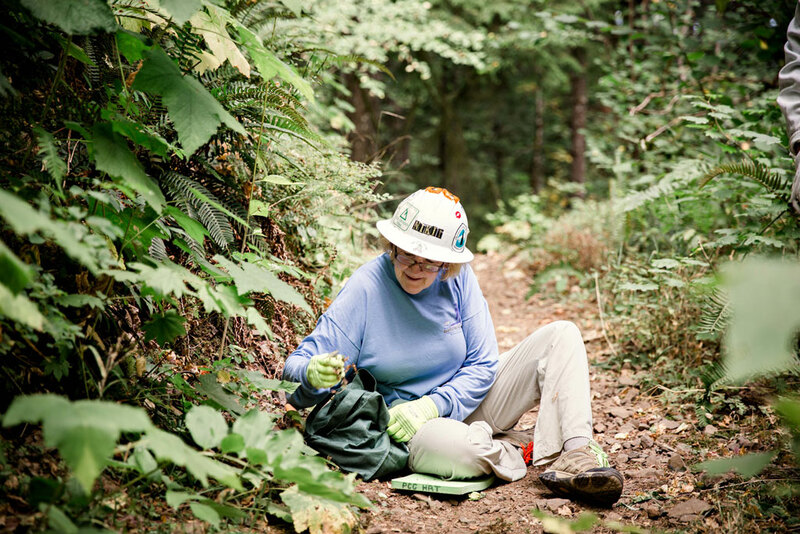 Volunteers perform trail maintenance in both the front-country and designated wilderness areas. Some efforts require volunteers to backpack into the work sites, while others provide the luxury of car camping at major trailheads. Many of PCTA’s backcountry trail crews benefit from the volunteer service of horse and mule packers. These volunteers and their stock haul food, tools, kitchen equipment and even water into remote basecamps, ensuring trail crew members have all they need to take on trailwork in the backcountry. 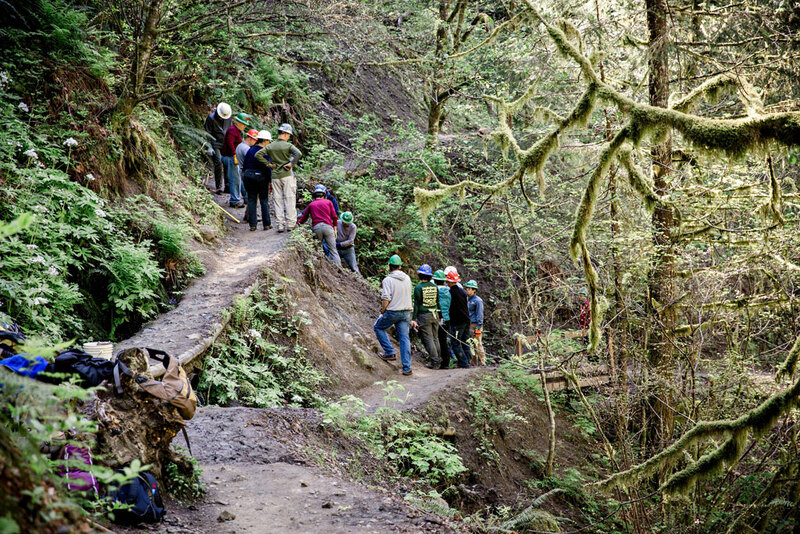 PCTA’s Trail Skills College helps volunteers build their skills and be successful in their trail work by providing education and training in safe trail construction and restoration. Using modular courses taught at multiple events along the trail, volunteers, PCTA staff, nonprofit partners and agency staff serve as instructors to new and returning volunteers eager to increase their trail-maintenance knowledge and skills. With the trail as the classroom, courses cover topics such as brushing, scouting, tread reconstruction and crew leadership. The Trail Skills College also offers saw training and certification courses conducted by volunteer saw instructors. This unique program is one of the first in the country authorized by the U.S. Forest Service and has served as a model for other trail organizations. Beyond Trail Skills College, you’ll learn a ton by just showing up. Every season we have loads of projects for first time volunteers. Attending class before your first stint is not required. Our volunteer crew leaders will train you out there. We store a lot of great information about our volunteer program on our website. Training resources, details on upcoming projects, volunteer guidebooks, answers to frequently asked questions, etc. It’s all there. Can’t find the answer you’re looking for? Don’t hesitate to contact me, PCTA’s Volunteer Programs Assistant, at (916) 285-1838 or at [email protected]. 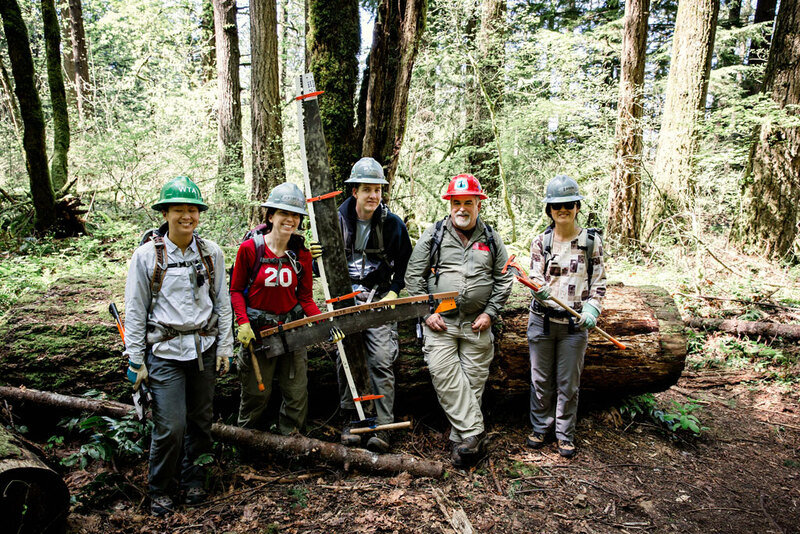 We are so grateful for the efforts of trail maintenance volunteers, and are always looking for new, enthusiastic volunteers to join the ranks! Ready to sign up? Fill out our volunteer application today. Ellen is PCTA’s Volunteer Programs Coordinator. She works in PCTA’s Sacramento office, supporting the volunteers who dedicate their time, energy and passion to the trail.